Inflation statistics are always kind of hard to read -- what is driving the rise? Is it across the board or a glitch in one sectors? The media tries to deal with it by presenting a second number which is the number without the more volatile food and energy number. The combination of the two gives a bit more information. But this simple chart is way better. It shows inflation by component at the same time while showing how much that component is weighted in the overall metric. Via zero hedge. 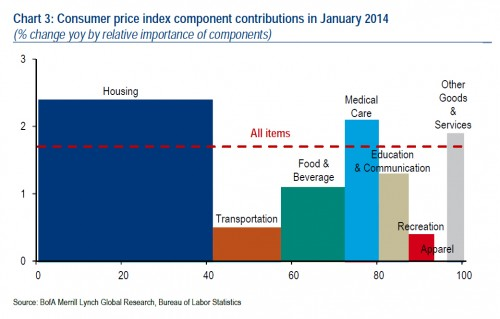 the problem with this chart (and with CPI) is the way that the housing section is calculated. so, rents are up 6%+, home prices are up 12%, and that averages out to, wait for it... 2%? it uses a complex and baroque concept called "owner equivalent rent" which is so complex, nearly no one understands it. but it's results are absurd or, at best, at least highly inconsistent with the rest of cpi. OER takes into account all the people who do not move and do not have their rents rise and calls that zero and averages it in. funny, they do not do that with TV's or cars. why is rent so different. they do the same with a complex calculation around purchase price. 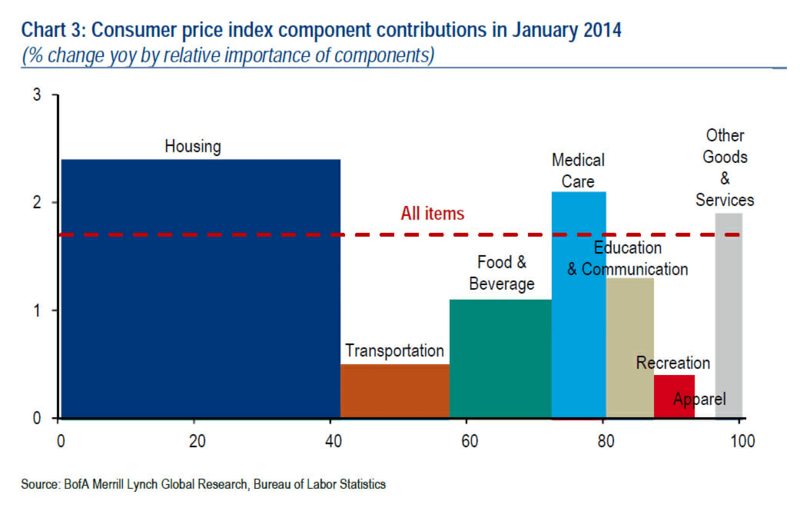 this makes the biggest component of CPI not a measure of price level at all. inflation is change in price level. price level is based on prices that prevail in the market right now if you want to buy somehting. if you need to rent an apartment in san francisco, what the average renter is paying if they have 5 year old lease with rent control is completely irrelevant. what matters is the current market price. but that is most emphatically NOT what OER measures. it's some sort of trumped up measure of average cost of living on housing, which has very little to do with inflation as it is actually defined. add in layers of (badly controlled and improperly offset) geometric weighting (substitution, which generally should be offset by a quality adjustment anyhow) and arbirtary quality adjustments and you get a CPI that is nothing like a measure of inflation but predominantly a hodge podge of cost of living and assumptive definitional libmo dancing to keep entitlement costs down without haveing to actually pass cuts. Very few places have rent control, so I doubt that's a big factor. Overall I think CPI does a pretty decent job. actually, the far bigger effect that holds OER far too low is that 1. most people do not have rent raised every year, and if they do, have limits on by how much either contractually or by statute meaning that most folks pay under market rate rent and 2. by far the biggest one, is that mortgage payments stay flat and that is used to generate the data, not the current market price of housing. then, cpi has layered on some severely contradictory and arbitrary adjustments (all to make it read lower) since the 90's. it's worth noting that this was the deliberate goal of these policies. it was not to "be more accurate". it was "to reduce cpi so that social security and medicare/aid adjustments would drop, making them cheaper." that was precisely why greenspan and clinton did it and the knock on effects have been serious as cpi is used as the basis for a great many things. the "it's more accurate" crowd (boskin) came later as paid apoligists for the desired policy. if you want to have some fun, read the actual boskin report sometime. it is STAGGERING in that it does not provide a signle piece of empirical evidence in support of the new methodology. it's just hypotheticals and supposition. much of the "adjustment" in the cpi data is self defeating anyway. substitution (geometric weighting) is used to change the basket of goods used. if the price of rib eye rises, they assume you eat less and substitute say, flank steak. while this is certainly plausible consumer behavior, it also means we are no longer measuring price level, but rather something like "cost of living" but not even really that as we are not holding utility constant. but the real issue is that there are also quality adjustments. this year's ford mustang is deemed to be X% better than last year's and that is taken out of the price. totally subjective, but plausible. more hp, better radio, whatever. but consider how this intersects with substitution. we switch from rib eye to flank steak due to price and that keeps cpi low, but should we not also have a negative quality adjustment? ribe eye is better than flank steak. how do we know? the market tells us. look at the price per pound as well as the previously made assumption that we would rather be eating it, but are not doing do due to price. thus, in most cases, substitution effects should be perfectly offset by negative quality adjustments, but this is NEVER done. this is the sort of thing that makes CPI read way too low. substitution also makes some very questionable assumptions. it assume that we are price takers and prices come to us exogenously (supply driven). this is mostly not so. sure, sometimes the size of a corn harvest is the cause, but mostly, it's DEMAND driven. and what that happens, the CPI substitution assumptions have the wrong sign. if gap isnow cool and abercrombie is not, the former rises in price, the latter falls, and CPI assumes we buy more abercrombie. but we don;t. we buy more gap. the fact that we are buying more gap is WHY the price rose. they ahve the causality backward for most of the economy. it's a truly awful set of calculations, and the drum beat of "cpi still reads too high" we see from the revolving door system of policy wonks, think tankers, and government appointees is another whitewash to try to reduce entitlements without admitting that this is what they are doing. (note the recent attempt to move to "chained dollars for SS and the explicit reasoning behind it). this is post modern economics. start with what you need the numbers to read, then devise a system to get there. if there is anyone who really thinks food inflation is currently 1.5%, i would love to know where they shop. my consumption is pretty much the same, and my bill is up easily 50% over the last 6 or 7 years. anyone who thinks housing is up sub 3% similarly must have one hell of a realtor. some things (apparel, electronics) sure, they have little if any inflation (at least at the middle of the curve, the high end id quite different, but not big enough to move the needle much), but they are also dwarfed by shelter, food, and healthcare. folks love to trot out "this iphone is equivalent to these 17 radio shack appliances from 1980" like it means somehting major to consumer prices. sure, it's cool. it's useful. it's an amazing example if ingenuity and progress. but all that stuff together isn't 10% of consumer spending. trying to use iphones to explain away food and housing is trying to use the tail to wag the dog. CPI runs 2-4 points too low. it's not a coincidence that we have had only low inflation since the change. it was defined out of existence. current inflation (market price level change) is more like 4-5% using actual metrics of market price level. let's be very conservative and say that home prices are up 10% (case shiiler says 11.3%). 65% of americans own rather than rent. so let's weight it like that. .65 X 10 + .35 X 4 = 7.9%, not the 2.4% reported. 7.9% X 0.4 (the weighting as a % of cpi) = 3.16, roughly twice the 1.6% just reported, and we have not yet counted the inflation from any other item, just housing. getting to 4-5% overall from there is easy. So you believe that the median American was MUCH poorer in terms of material consumption 30 years ago than today? Because that's the implication of your numbers. One might wonder why the median American now lives in a bigger house, drives a better car, and eats better food, not to mention the host of electronic technology wonders that surround us. I'm old enough to remember what things were like 30 or 40 years ago, and I think that if anything the CPI overstates inflation.